Captain Billy Baum owner of the Dream Girl retired in 2000 after fishing 50 summer seasons at Oregon Inlet and 32 winter seasons in Florida with over 60,000 happy fishermen. When it comes to captains and mates, you won't find a more dynamic duo than captain Jason Snead and mate Jimmy Hillsman. They truly care about their anglers having an enjoyable day of fishing. 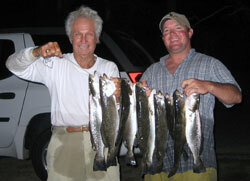 Jason Snead has been fishing for a lifetime and has been Captain of the Dreamgirl since 2004. First working as a mate on different boats in the area and later as Captain on commercial, private and charter boats up and down the east coast. With the Dreamgirl family business being around since the beginning of Outer Banks Charter Fishing over 75 years ago, we've got the experience and knowledge to make your fishing dreams come true. With the Dreamgirl family business being around since the beginning of Outer Banks Charter Fishing over 75 years ago, we've got the experience and knowledge to make your fishing dreams come true. Jimmy Hillsman (bottom pic) is the best mate ever on the Dream Girl. He's always prepared for any type of fishing. 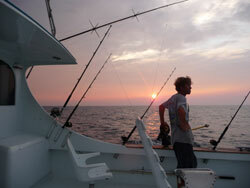 He's excellent with helping children and making sure that they enjoy their offshore fishing experience.